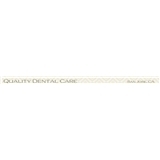 Quality Dental Care (San Jose) - Book Appointment Online! Dr. Owais, DDS, MS, at San Jose CA has been a dentist for 14 years, he practices a full scope of family, general and cosmetic dentistry. Using the best dental materials and latest, carefully tested, techniques, Dr. Owais can now restore and maintain your healthy smile, and, when needed, correct a wide variety of so-called permanent cosmetic dental problems, and can literally redesign your smile. Dr. Owais came recommended by a friend. I had a great first experience as a patient, the office staff were all friendly, and I will be back!